On Saturday, October 1st, the Red River Runners will meet at Jaffa in Ciputra and there will be three routes, 5 K, 8 K and “the shortest possible” way around the lake (~13 K) . 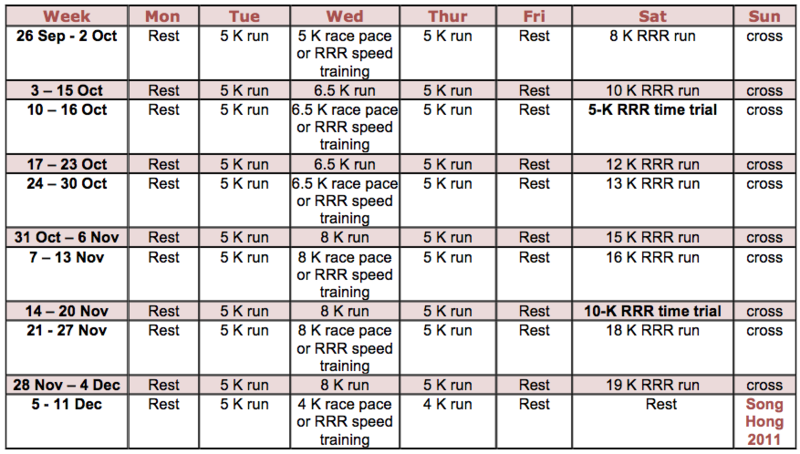 As a service to the folks out there entering training mode, we translated and modified the Hal Higdon’s training schedule for the Novice 2 Half Marathon training. Use it for inspiration and find yourself a good 5 K route you’ll do in an easy pace twice a week on Monday, Tuesdays, Thursdays or Fridays. The runs on Wednesday and Saturdays we’ll do our best to help you with. So show up for Wednesday 5 K speed training at 20.15 in front of Sedona and a cosy Saturday Run at Jaffa at 16.55. And by the way … someone just asked me what it cost to participate in Red River Runners. I think we have completely forgot to write it, but it is fairly straight forward. sign-up fee: 0 VND, Run development contribution: 0 VND, speed training 0 VND, Saturdays runs: 0 VND, late fee: 0 VND, etc. We like to run and do this for the good company and joy of getting one foot to move in front of the other. So as all the best things in life, like good friends and love, it is for FREE! The races are mostly volunteer work, although we pay a fee here and there. Sponsors and partners are very helpful and the total cost is fairly low. There are, however, a registration fee for all races arranged in the name of RRR, and we proudly give away the entirely surplus to charity.